I said in the last update that this one would contain the date of the next round of testing, and I was half right! But first, where are we up to? Most of our time, until last weekend, was spent finishing and perfecting the design implementation, and I'm happy to say this is now complete for the initial version. There are some things that will probably be missing from the first release (that I'll get to shortly) but everything we're planning to put in is designed and styled. This week we've been playing the fun game of Front-End meets Back-End, which is going largely to plan. We hope to have this finished by Wednesday (23rd) of this week. After that comes some internal testing to make sure we haven't missed anything, and then we head towards the initial, limited-time release. 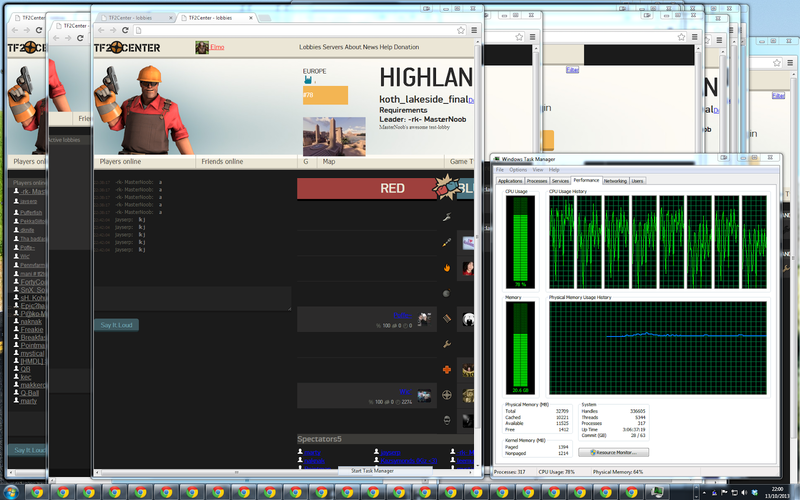 We've also been given the use of some virtual machines for hosting the site and game servers. The machines themselves are pretty awesome and should allow us to host a whole load of game servers for you guys to use. Running some benchmark tests on the application server VM. I think it'll be okay. We've tested the site ourselves. We've tested with a handful of friends. We've tested the multi-user aspect of things as much as we can, considering there's only a few of us! We've even abused Chrome's profiles to get as many instances of the site running as we can at one time, to see what the performance is with many clients connected. But this is obviously different from the real-world, many tens / hundreds of concurrent users. As such, we will (at a date yet to be determined, but likely within 2-3 weeks) be opening up TF2Center for a roughly-one-day open beta test. That is, the site will be available for everyone to use, but just for a limited time. At the end of the day, the beta will be closed and we will go off and fix any bugs that came up, check out our logs and make sure we're happy with how everything was running from our end. The final open release date will depend on results from this open beta, and we'll be inviting as many people as possible to give us their thoughts and feedback. We stress that during this open beta, things may go wrong and the fixes may (in the worst case) require the server to be restarted or the beta to be closed early. We don't expect this to happen but the open beta comes with the disclaimer that things may break, and we ask for your patience if these situations arise. We'll keep you posted with updates as we get them. Any questions or comments, as usual let us know here, via Steam or email info@tf2center.com. There should be option to subscribe for news. This option already exists. Go to the blog's homepage. Look at the bottom. There is a link "Subscribe to: Posts (Atom)". Use any RSS reader to subscribe.